Text GLOWS IN THE DARK! Note: Prices subject to change based on the amount of orders received. Current price based on a total of 500 orders per wristband type overall. – $2 discount available if purchasing 1 full set of nine (9) wristbands. – $1 discount for every additional set of nine (9) wristbands purchased. INTERNATIONAL: PAYPAL ONLY! If you wish to arrange another method of payment, please contact me using the information found on the order form. 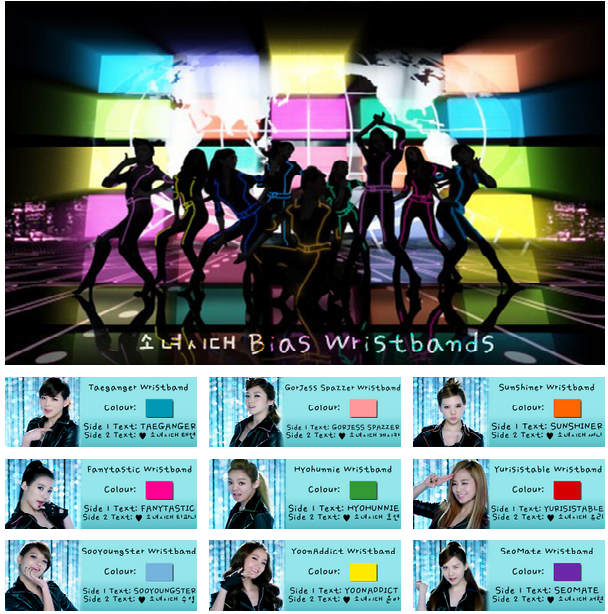 Write “SoShiCatalogue” in the “Where did you learn about SNSD bias wristbands?” box. If you do not wish to fill out the order form, please leave a message in the ask boxstating your desire to place an order. Alternatively, you can email me at silentxautumn@yahoo.com . PLEASE READ THE ORDER FORM CAREFULLY! Reminder: If there is an insufficient number of preorders, then wristbands will NOT be available after the preorder period. there are also bulk orders for certain countries. Is this related to SSF? when is the release date of these wristbands? This project has already ended – orders were due on Sept.9 and wristbands were shipped on Oct.1. is there anyway to buy these wristbands? would i still be able to order? or maybe a 3rd batch will be up? I still get emails for this, so I’ll leave this here: it’s still possible to order. Please email or tweet me for more details. The contact details are still the same.